Brooks emigrated to Canada in 1906. 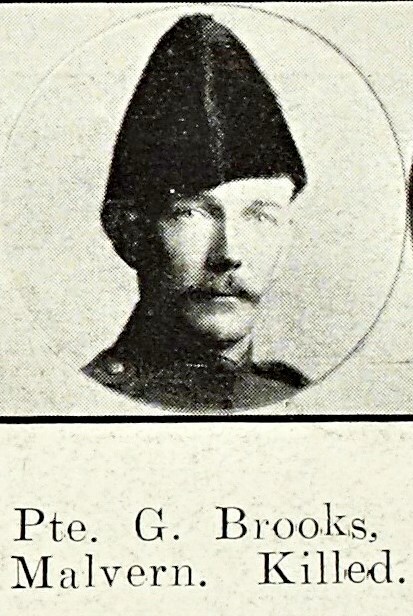 He joined the Canadian Infantry and came to England in June 1915. He made a short visit to Malvern Link during his stay, before proceeding to France in August. Soon after entering the front line he was slightly wounded. Whilst in Malvern link he was associated with the Free Church and Sunday School. In February the following year, his father received a letter form the Canadian Record Office stating that on the 18th November his son Pte George Brooks was rendering first aid to the wounded, crawling from shell hole to shell hole in No Man’s Land, throughout the day. Completing this work, he crawled back to the trench and was rising to climb over the parapet when he was shot through the head by a German sniper. He was buried in front of the line. Noble sentiments having lost a brother. 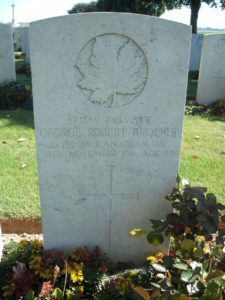 George Brooks’ body was recovered from the battlefield and today lies buried at Adanac Military Cemetery. Found on the Somme, Adanac was contains predominantly Canadian burials and takes its name from Canada backwards.